Disket, Nubra Valley, J&K, India – Thiksey Rinpoche met His Holiness the Dalai Lama as he arrived at the Disket Monastery teaching ground this morning and escorted him to his throne. Before taking his seat, His Holiness spent a couple of minutes listening to the nuns who were debating. He announced that he would be giving the permission to practise ‘Avalokiteshvara Who Liberates Beings from All Unfortunate Rebirths’ and that he would conduct the necessary preparations, while the Nubra community made a Long-Life Offering to him. After recitations of a Praise to Buddha Shakyamuni, the Heart Sutra and the Praise to the Seventeen Nalanda Masters the Chant-master began the Long-Life Offering according to rites from the sutra tradition upheld at Tashi Lhunpo Monastery. It was based on prayers to the Sixteen Arhats, the Elders who promised to protect the doctrine of Buddha Shakyamuni. 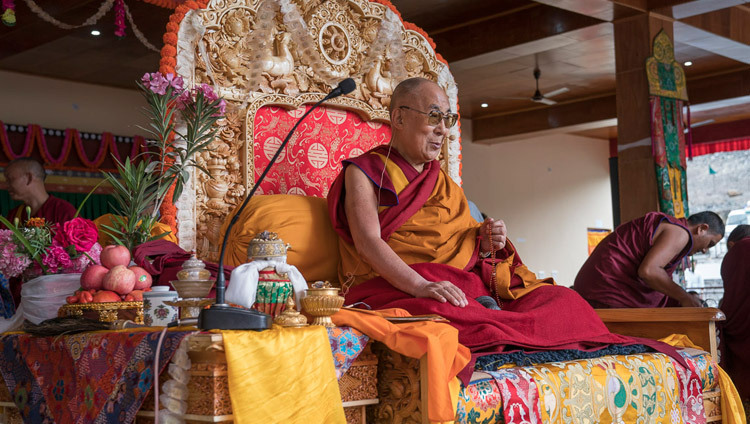 When the Long-Life Offering was complete, His Holiness explained that the Avalokiteshvara permission he was about to give derived from the visions of Tagphu Dorje Chang. He remarked that Mitrayogi, who accomplished his practice in dependence on a similar Khasarpani Avalokiteshvara, had received empowerments and blessings from Avalokiteshvara himself, and Tagphu Dorje Chang had visions of the great yogi as well. “I received the collection of Tagphu’s visionary teachings from Tagdag Rinpoche when I was young,” reported His Holiness. “And I did the required retreat during which I collected 600,000 six-syllable mantras. It’s said that each time you receive this permission it eliminates one rebirth in the lower realms. Before beginning to give the permission, His Holiness led those in the crowd who were interested in taking the precepts of lay-practitioners, the upasaka and upasaki vows, thereby securing the four-fold Sangha of monks, nuns and lay-practitioners. 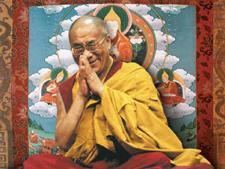 He followed this with a ceremony to generate the aspirational awakening mind of bodhichitta. Once the permission was over, His Holiness resumed reading from the ‘Stages of Meditation’, during which he touched on the nature of suffering, conventional and ultimate bodhichitta, calm abiding and special insight, and concluded with the verse of dedication at the end.